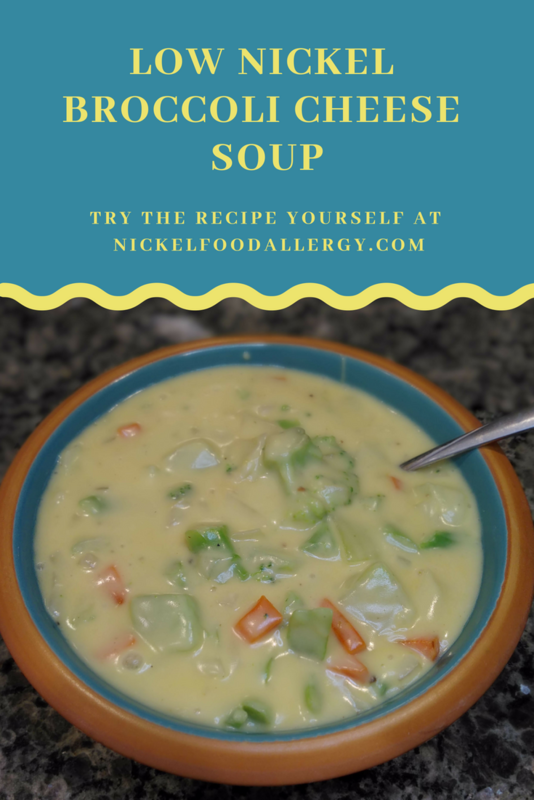 Try this low nickel broccoli cheese soup recipe! As a young child, often I would personify the florets of broccoli and cauliflower and tell them “good-bye” before dunking them in ranch dressing and eating them. I crave broccoli and love its fresh crunchy raw taste. Fortunate to live in Hong Kong for a month in 1997, I relished the opportunity to eat Chinese broccoli nearly every day. Most often cooked in oyster sauce with garlic, I could not get enough of its flavorful taste. Low in nickel, broccoli is a member of the cabbage family and Chinese broccoli is more related to the kale family. I am able to eat broccoli without issue, however when I occasionally enjoy Chinese broccoli, it does cause my eczema to react. High in fiber and loaded with various vitamins and minerals, broccoli is considered high in both vitamin C and vitamin K. Broccoli also contains vitamin A, Thiamaine (B1), Riboflavin (B2), Niacin (B3), Pantothenic Acid (B5), Vitamin B6, Folate (B9), calcium, iron, magnesium, phosphorus and zinc. Research studies in 2010 identified how the sulforaphane found in broccoli has been shown to treat and kill certain breast cancer cells. I try to eat raw broccoli as often as I can while at work. 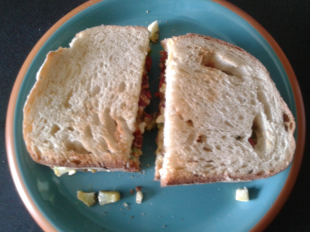 With my restrictive diet, there’s only one food my spouse cannot tolerate: broccoli. 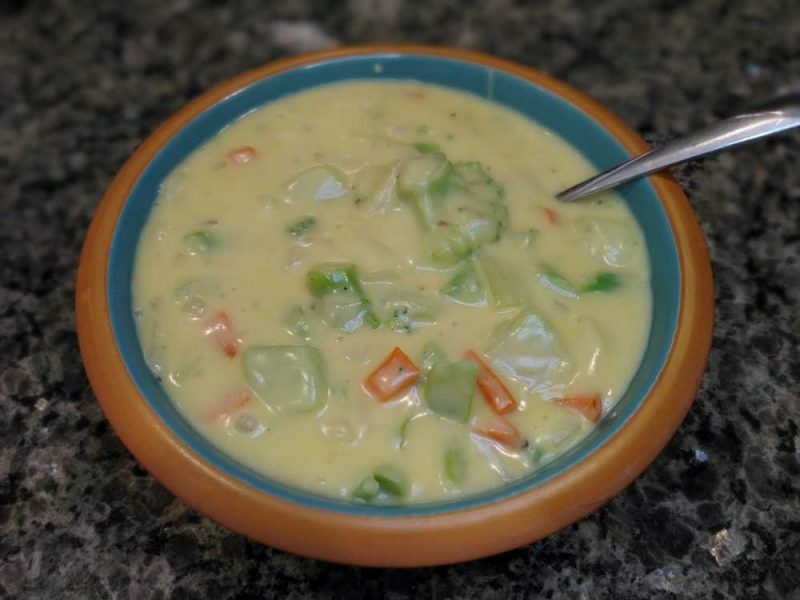 Unsure if it’s broccoli or if she’s sensitive to it’s salicylate, I’ll use frozen broccoli florets to make myself this creamy low nickel broccoli cheese soup when she’s craving something I can’t eat. This recipe makes about 3-4 large servings and requires attention to the timing. 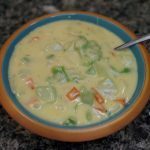 This creamy easy to make low nickel broccoli cheese soup recipe is great for a cold day. Rinse and steam the broccoli in a microwaveable bowl with 2 Tablespoons water for 3-5 minutes and set aside. Coat the base of a deep ceramic Dutch oven with the olive oil and sauté the onion or shallot and carrots in the oil on medium low heat for about 5 minutes. Next stir in the flour and ground pepper and mix continually until the flour is thoroughly blended. Using a Pyrex measuring cup, combine the ¾ cups water with ¾ cups whole milk and slowly add the watered down milk mixture to the Dutch oven stirring regularly and watching closely. Bring the contents to a boil until the sauce begins to thicken, approximately 2-5 minutes, at which you’ll add the steamed broccoli. Once everything is thoroughly combined, remove the Dutch oven from heat and immediately stir in the shredded cheddar jack cheese, which surprisingly melts quickly! Serve yourself up a bowl and enjoy! This recipe makes about 3-4 large servings and requires attention to the timing. 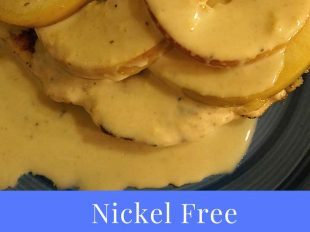 Many experts say broccoli, cabbage, brussels sprouts, and cauliflower are HIGH, not low, in nickel. Other than corn, artichokes, and eggplant, I really don’t know what veggies are safe to eat. I haven’t seen lists identifying broccoli, brussel sprouts, white cabbage and cauliflower as higher in nickel. Penn State Dermatology’s list is a little confusing, but it states it’s not necessary to restrict these foods, noting they are not higher in nickel. Which low nickel diet lists are you referring to? Thank you for your work on your website, Christy – the recipes, tips, and commiseration are really helpful. 🙂 I look forward to branching out with these recipes. Many thanks!!! Thanks for you comment and appreciation for my website! 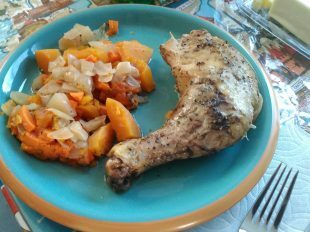 I hope you try and enjoy a bunch of my different recipes!